TestIT!2011, the first. Intel is starting Germany's biggest test campaign. Our readers have also been asked to take a closer look at the notebooks for this. Naturally, we couldn't resist checking the available laptops ourselves. 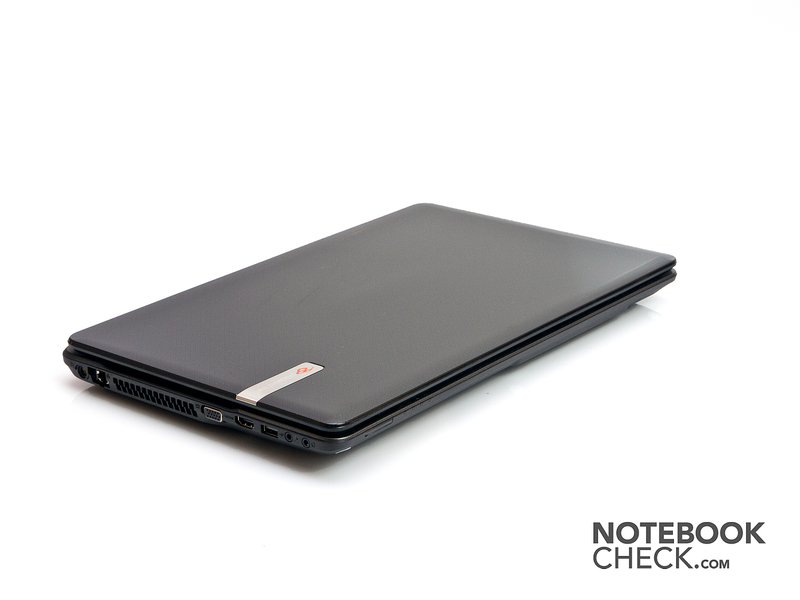 In this review, we're dealing with an old acquaintance, the Packard Bell EasyNote TS11. TestIT!2011 is the title Intel has given the big test campaign to take place from 30th April until the end of July 2011. The idea: Private persons are supplied with an Intel Core i CPU and HD Graphics 3000 laptop for a week and can test it for free. The corresponding test notebook can either be acquired over online Internet retailers or at a participating Euronics store. There are a number of laptops from the most various manufactures to choose from. The notebooks are to be distributed to schools and other educational institutions after the campaign. More information about the campaign can be found here (German). 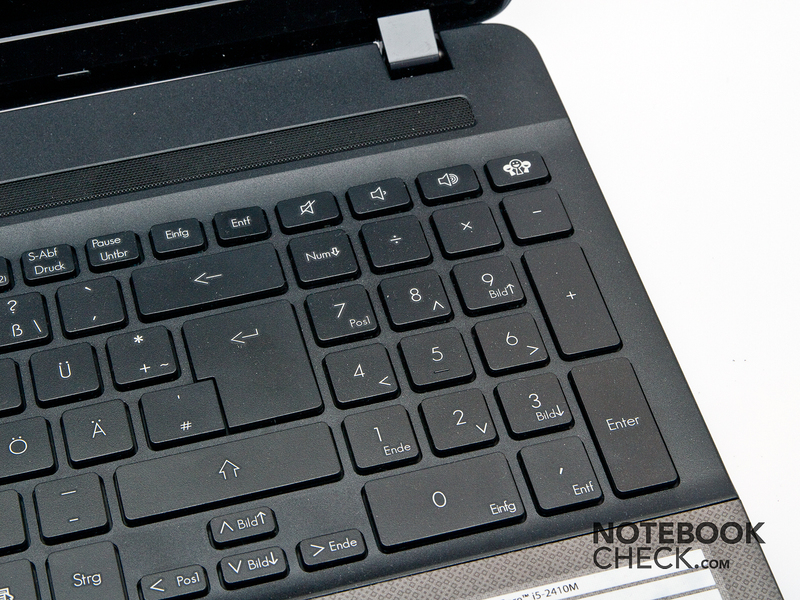 We will look closer at a model from Packard Bell in this review. Packard Bell has, alike many other manufacturers, sent two notebooks into the race. We look at the stronger alternative with an Intel Core i5 processor. 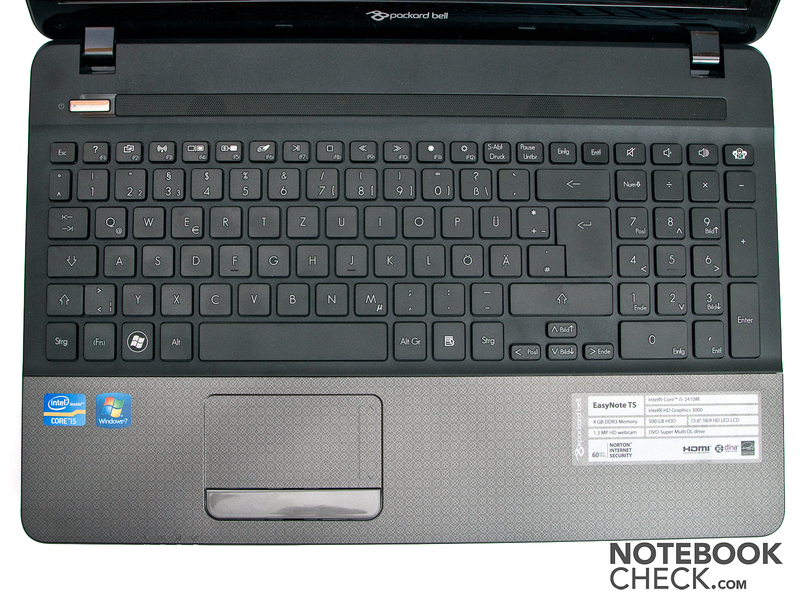 We have had the equally built Packard Bell EasyNote TS11 in review a while ago. It still had a Core i7 quad core processor and a dedicated graphics card then. They have been left out for the TestIT!2011 campaign. The tested TS11-HR-158GE has the same case, which is why we would refer to the previous review in regard to parts about case, communication, keyboard and touchpad. Update: The Packard Bell TS11 notebook in this review has the affix TS11-050GE in Germany and is only available in MediMax chains during the campaign. Therefore, our Internet research falsely found the HR-040UK (UK only). The name for the German model is TS11-050GE. Hardly any modifications have been made on the notebook's connectivity since our last test. Merely the USB 3.0 port has made place for an additional USB 2.0 port. Otherwise, there aren't any changes in terms of connectivity. They are still placed very far front on the laptop, which can quickly result in cables for peripherals being in your way beside the notebook. In particular, the USB ports located very far front, and which also belong to the most frequently used connections, could cause quite a cable mess. 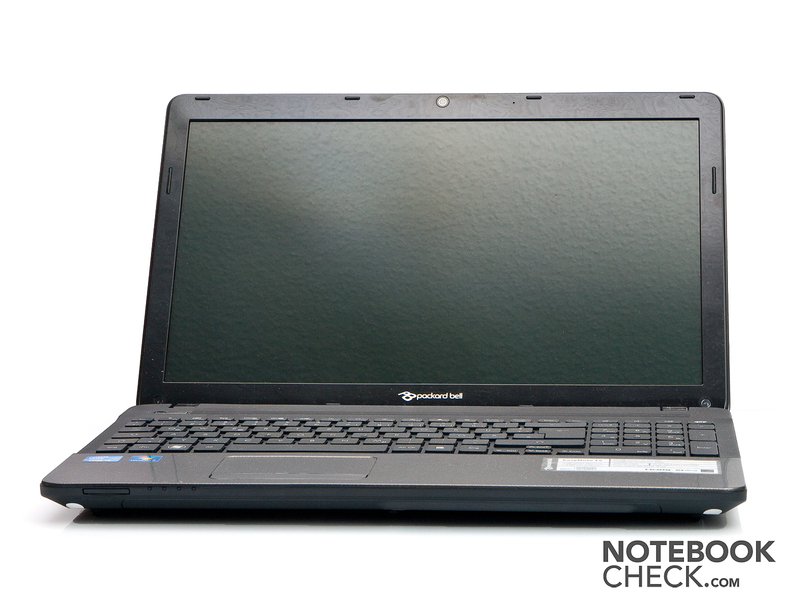 Packard Bell continues to equip the EasyNote TS11 with a 15.6 inch display with LED backlight. Nothing has been altered in terms of resolution either. It is still 1366x768 pixels. The aspect ratio is 16:9 and is thus very suitable to render a lot of DVD movies without excessive black bars. 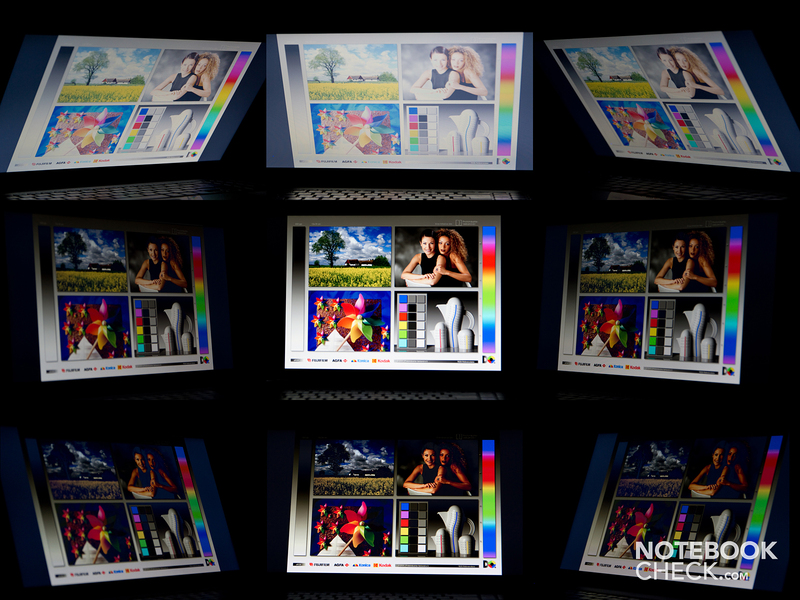 The EasyNote TS11 achieves acceptable rates thanks to the LED backlight. A maximum brightness of 214 cd/m2 isn't anything special anymore. The average brightness of 203.7 cd/m2 is also sooner typical at the moment. Other laptops move in quite different spheres, although the rates are acceptable for a low-priced device. The display's illumination of 86 percent is also acceptable. The black value of 1.21 cd/m2 is quite high and, together with the mediocre brightness, it results in a contrast of only 168:1. It doesn't look like the EasyNote TS11's screen has been changed since our last review. Both graphs almost equal each other to 100% when the color reproduction of our last test sample is compared with the current one. The present test sample also can neither render the Adobe RGB color space nor the sRGB color spectrum completely. The non-professional user shouldn't be impressed by this, though. The EasyNote TS11 doesn't fare very well outdoors. The average brightness, the glare screen and the low contrast prevent you from seeing anything when sunlight shines directly on the display. You should preferably look for a shady place so that the display content at least remains legible to an extent. Both EasyNote TS11 models don't vary much in viewing angle stability, either. Several people can still see everything on the screen on the horizontal plane. The colors invert very fast and the picture gets unrecognizable vertically. However, the majority of screens built into notebooks of this price range behave this way. The midrange dual core processor, Core i5-2410M from Intel is the system's heart. It belongs to the latest Sandy Bridge architecture. Together with the Intel HD Graphics 3000, it is also the main subject of the TestIT!2011 campaign. The processor has a clock rate of 2.3 GHz. Thanks to Turbo Boost 2.0, it can be overclocked dynamically in several steps by the system should more power be needed. Both levels are as follows: 2.6 GHz clock (2 cores loaded), respectively 2.9 GHz (1 core). The Turbo Boost function is only used when sufficient cooling is guaranteed, though. In terms of performance, the Core i5-2410M can be placed on about the same level as a Core i5-560M with 2.7-3.2 GHz. Thus, the i5-2410M is a good all-round processor that is fully sufficient for most notebook tasks. The processor corresponds to Intel's current standard with a TDP (thermal design power) of 35 watts and is quite modest in view of power consumption. Another major advantage of the processor is the incorporated graphics card. Thus, a separate chip doesn't have to be installed and energy is additionally saved. However, components that don't consume much power usually don't excel in performance, either. This is also the case with the Intel HD Graphics 3000. It has also been rather more designed to carry out basic tasks. Among them Internet surfing, editing Office documents or the playback of video streams from the Internet. Playing elaborate 3D tracks doesn't belong to this graphic card's application field. Nevertheless, the graphics card isn't entirely unsuitable for games. However, you have to make compromises in terms of resolution and details. In return, you are usually rewarded with a long battery life. Details about the HD Graphics 3000's gaming performance can be found on our detail page for the GPU. 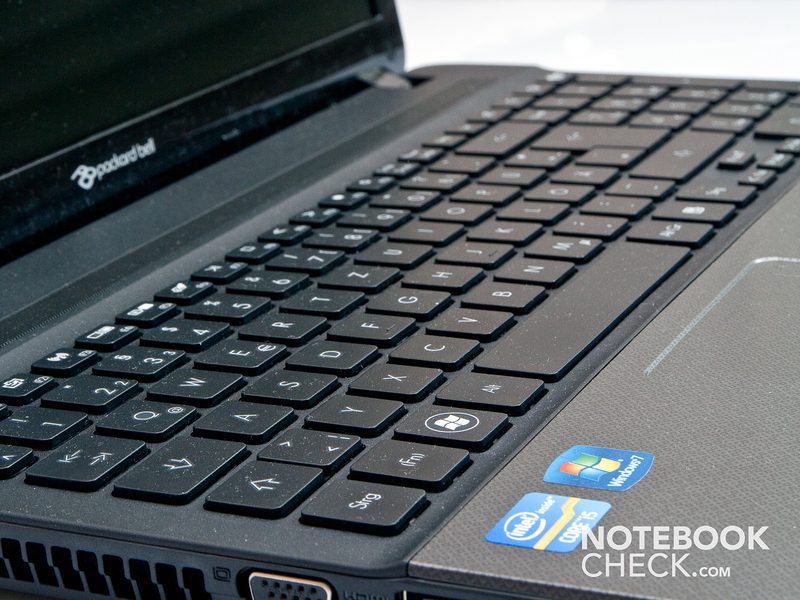 The Packard Bell EasyNote does a good job in our Cinebench R10 single core rendering (64 bit) benchmark. It is quite far up in the chart with 4638.0 points. In comparison, the Alienware M18x, equipped with the Intel Core i7-2920M Extreme CPU, is at the top of the chart with 6346.0 points. 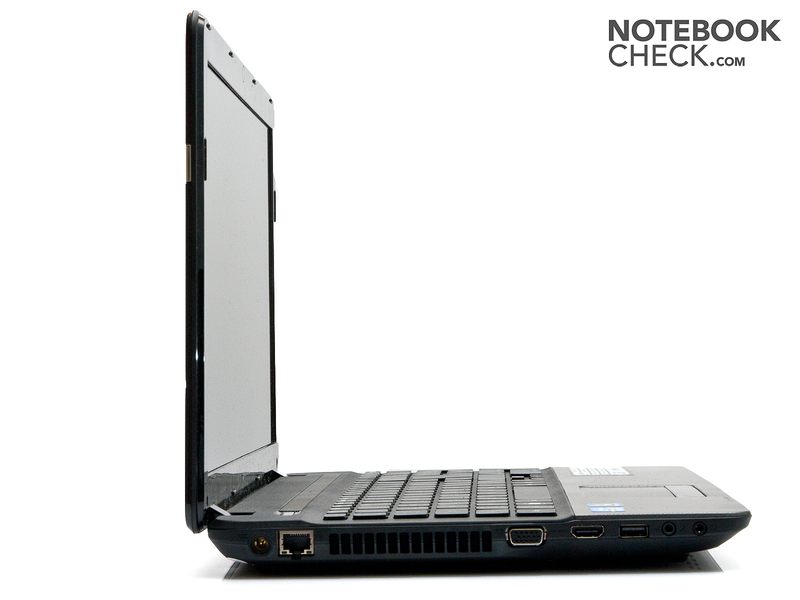 The Packard Bell EasyNote TS11 from our previous review (2530QM) is directly in front of the EasyNote TS11 from the TestIT2011 campaign. It only has a lead of 2 points on the promotion model with 4640.0 points. 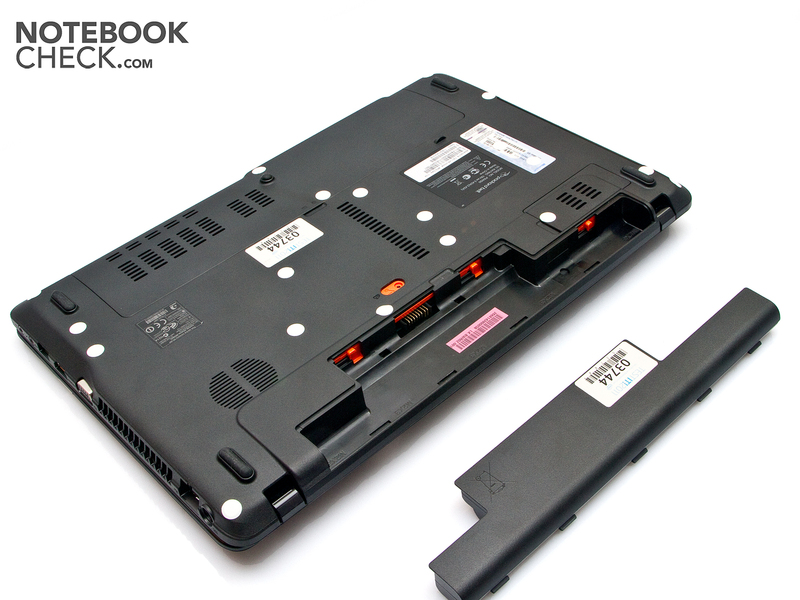 With 9711.0 points, the EasyNote TS11 within the range of notebooks, such as the Lenovo Lenovo ThinkPad Edge E420s-NWD4NGE (2410M, HD 6630M) with 9788.0 points or the HP ProBook 6360b LG632EA (2410M, HD Graphics 3000) with 9675.0 points in the Cinebench R10 multi CPU (64 bit) benchmark. That is on the expected level of the installed CPU. The Intel HD Graphics 3000's low performance has an impact on the Cinebench R10 shading test (64 bit). The EasyNote TS11 reaches 5333.0 points here. In comparison, our last EasyNote TS11 test sample with a Radeon HD 6650M manages 7448.0 points in this benchmark. 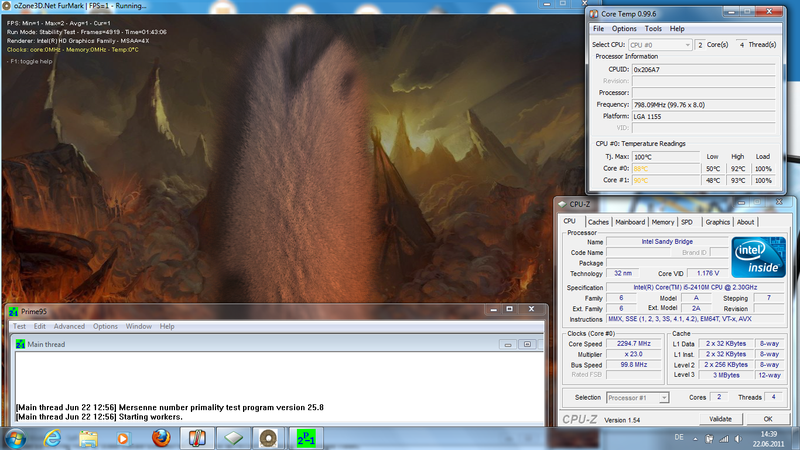 The result suffers accordingly in the 3DMark 06 benchmark, as well. The TestIT!2011 test model only reaches 4607.0 points here, while the sister model with the Radeon HD 6650M manages 7250.0 points. Among other tests, e use the PCMark Vantage benchmark in order to assess the entire system's performance reserves. The ProBook TS11 achieves a satisfactory result of 5212 points here. Notebooks with a comparable (equal) configuration (CPU, GPU) are partly even better here. HP's G6, for example, reaches 6066 points, while the office expert, HP ProBook 6460b, clearly takes the lead with 7703 points. The difference is likely found in the detail of the other components, such as RAM and hard disk. Windows' Performance Index rates the system with 5.6 points and indicates that the weak point is found in the incorporated GPU in regard to gaming performance, as well as the installed hard disk. The installed WDC WD5000BPVT-22HXZT1 hard disk delivers a (gross) capacity of 500 GB. The hard disk corresponds to the current notebook hard disks with a size of 2.5 inches and a speed of 5400 rpm. Its performance data is also within the average. The maximum transfer rate of 72 MB/s is still acceptable, while the average transfer rate of 57.5 MB/s is almost below average. The access rate of 20.3 milliseconds is also not exactly outstanding. The opponents achieve rates significantly below 20 milliseconds with a similar configuration. The hard disk is thus confirmed to be a possible bottleneck of the entire system's performance. Besides all the web links to questionnaires and Facebook sides, there is a demo of the real time strategy game, StarCraft 2: Wings of Liberty, on the TS11's test systems desktop. Apparently, the testers are to be prompted to test a few rounds of this game. Of course, we also followed the call and checked how the laptop copes with the rather up to date game. It still works quite well in the lowest quality settings. The laptop achieves 69 frames per second and can display the game smoothly. However, as soon as the resolution or quality is set higher, the game starts to stutter and gaming fun relentlessly falls by the wayside. More games and their performance on the Intel HD Graphics 3000 can be found in our comprehensive comparison: Computer Games on Laptop Graphics Cards. Only little has changed in comparison to the last test in terms of noise. The EasyNote TS11's noise level is now 30.6 dB - 32.2 dB in idle mode (office use). In the last test, the notebook reached rates of 31.0 dB - 32.6 dB. The difference between the new test sample and the previous one can be ascribed to the measuring tolerance. 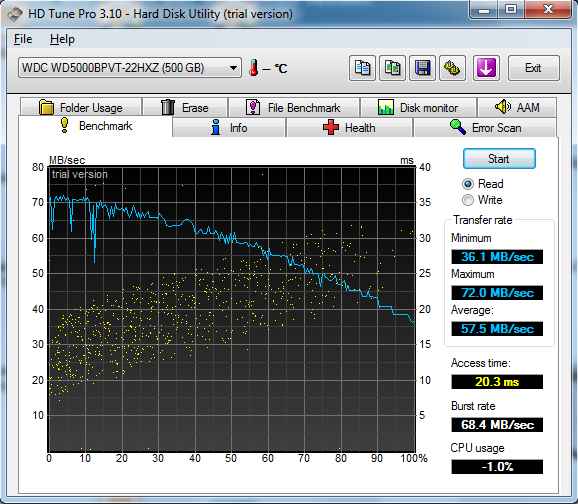 The hard disk's noise of 31.7 dB has also remained the same. Full load looks different though. The present model reaches 35.7 dB - 41.8 dB here and is thus significantly louder than in the last review (35.6 - 38.8 dB). Apparently, Packard Bell has changed something about the cooling system or in the fan management in the meantime. Fortunately, the optical drive's noise has improved since our last test. Back then, it was the loudest component in the laptop with 37.6 dB. Now it is a lot quieter. We see an improvement in terms of temperatures, whereas the temperatures in idle mode have increased slightly. This can be explained by the now omitted GPU on the one hand. On the other, it could also be due to the increased noise. 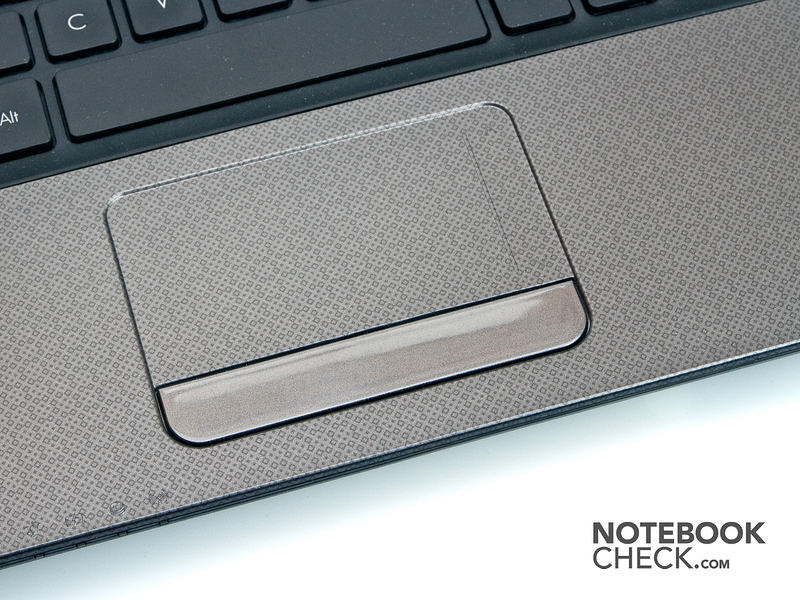 The warmest spot on the notebook's top is found around the touchpad in idle mode. It heats up to 28.8 degrees Celsius. Both wrist-rests heat up to 26.7 degrees Celsius (left) and 28.5 degrees Celsius (right). The warmest spot on the bottom is located in the laptop's center with 29.1 degrees Celsius. Overall, the Packard Bell TS11 is a bit warmer than our last test sample. The temperatures are still remote from reaching critical or unpleasant rates, though. The temperatures climb considerably during load operation. While the temperatures of our first review, where the alternative included a dedicated GPU, climbed up to 49.0 degrees Celsius, they are now 10 degrees lower with 39.0 degrees Celsius. We can explain this with a better cooling for one thing and also due to the slimmer hardware configuration, for another. After all, our previous test sample had to manage a Core i7-2630QM (45w TDP) and a GT 540M. The touchpad again reaches the highest temperature on the top with 39.0 degrees Celsius. Both wrist-rests measure 36.4 degrees Celsius (left) and 29.5 degrees Celsius (right) this time. The temperatures climb to a maximum of 39.6 degrees Celsius on the bottom. Thus, the notebook is just still cool enough to even use it on the lap for a longer time. The programs, Prime and Furmark, were once again used for simulating full load operation. Besides this, CoreTemp was used to assess the temperatures. They are higher than expected with up to 93 degrees Celsius, though. 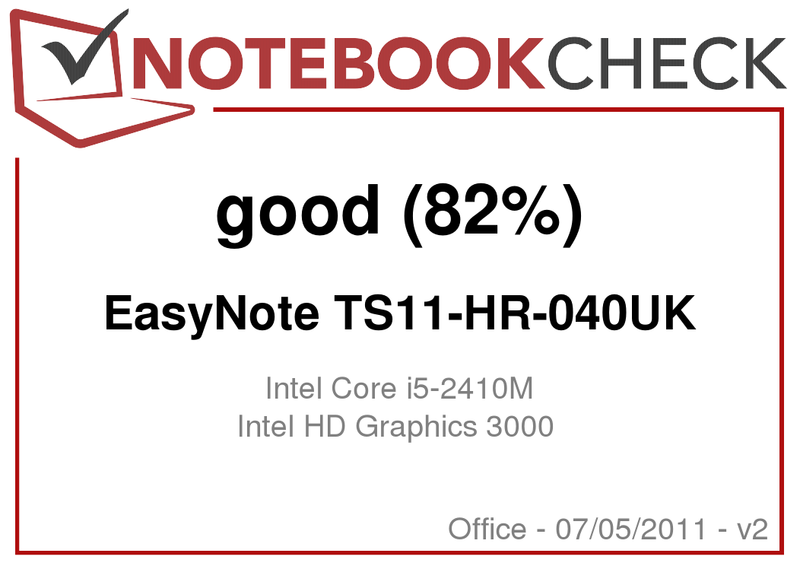 The EasyNote TS11 reached 4553 points in the subsequent 3DMark benchmark and is thus still within the range of the previously achieve results in a cold state. (±) The average temperature for the upper side under maximal load is 32.9 °C / 91 F, compared to the average of 29.4 °C / 85 F for the devices in the class Office. 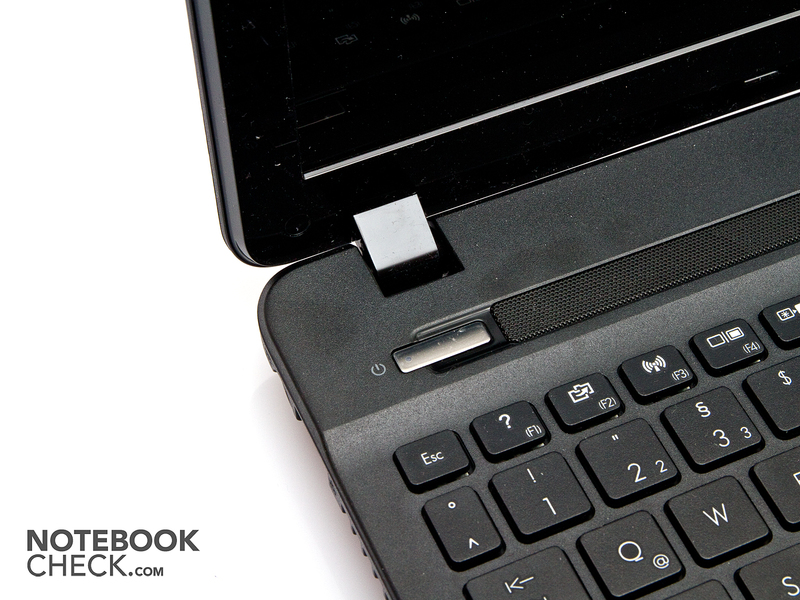 The speakers comply with the expectations that can be put on a modern notebook. The volume is good, the sound quality is moderate. However, the installed speakers are enough to watch a movie or listen to a bit of music on the go. As usual for such laptop speakers, they don't reproduce low pitches. Notebooks only supply a good sound in the odd case here, and notebooks that do usually have a separate, small subwoofer. The Packard Bell EasyNote TS11's battery life is quite impressive. As usual, the program BatteryEater Pro serves as the test basis. The EasyNote TS11 reaches a very satisfactory battery runtime of 7 hours and 27 minutes in the BatteryEater Reader's test (maximum possible battery life). In return, the battery runtime shrinks dramatically to 74 minutes in the Classic test (simulates load). If you want to watch a DVD on the go, you can count with a battery life of roughly 3 hours. At least you can surf with the EasyNote TS11 for over 4 hours on the go. About 90 minutes are needed to completely recharge the battery. 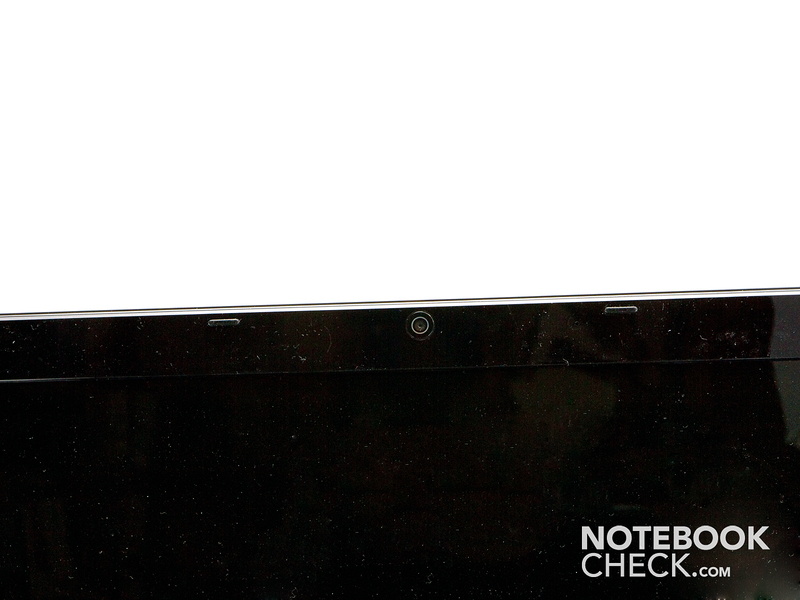 The Packard Bell EasyNote TS11 proves to be quite modest in idle mode. It only consumes 6.7 - 10.1 watts here. This naturally is beneficial for the battery life when only tasks with low requirement have to be managed with the notebook. When the notebook is put under load, the consumption increases to 37.2 - 56.9 watts. A consumption of 43.3 watts results when only the processor is put under load (e.g. with Prime). The included 65 watt power adapter is thus sufficiently sized and should always be able to manage the situation. Nothing has been altered on the Packard Bell EasyNote TS11's just looking at its outside. However, quite a few modifications have been made on the inside. 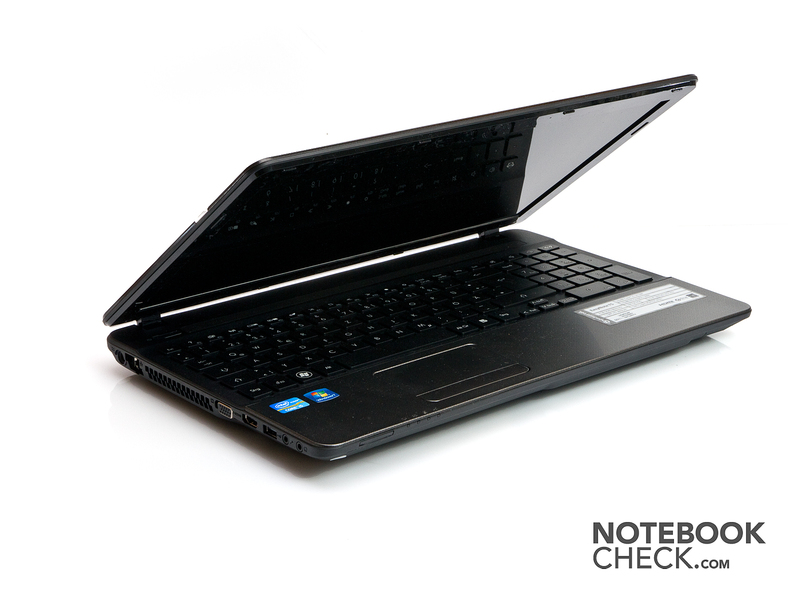 The notebook was a strong laptop with gaming ambitions in our last review. Now, the TestIT!2011 version is an entry level laptop with onboard graphics. The gaming capabilities have been ridded for the most part and have made place for longer battery runtimes. The notebook's focus is also more along the lines of office and Internet now. Considering the TestIT!2011 campaign's target group, this also makes sense. It is sooner aimed at laptop newbies who want to try out their first notebook at a relaxed pace. Overall, the user gets a well-manufactured notebook with a good keyboard, but limited performance. However, it's more than sufficient for all standard tasks, such as Internet surfing and office programs. If you only want to manage basic tasks on the laptop and don't want to spend too much money, you could be satisfied with the TS11. Base unit: The base unit doesn't make use of high-gloss parts. The base unit is made of rough, black plastic and the upper side is made of patterned, gray plastic. Keyboard: A chiclet keyboard with a number pad is installed into a fingerprint resistant base unit. The enter key's position is a bit unusual. You often hit the wrong key when not looking. The keyboard surface only yields marginally under pressure. Overall, Packard Bell supplies a stable case. Touchpad: The touchpad has a smooth surface, but there is a palpable "border" in all directions to delimit the wrist-rest. It facilitates finding your way around and you use it intuitively. There is a broad enough part integrated on the keyboard's right for scrolling. Alternatively, the touchpad bids a two finger scroll function ("gesture"), but apparently no other "multi-touch" qualities. Display: The display is a LED illuminated TN screen with a resolution of 1366x768 pixels. This makes a rather coarse impression on a 15" display. The display reveals every touch because of its high-gloss looks. Moreover, there is glare screen inside the high-gloss display bezel. There is no latch. The display lid is kept closed by the hinges. I couldn't determine the display teetering. It's kept firmly in position. The display opens very far toward the back, almost 180 degrees. As to the viewing angles, I would say that they are on the expected level. Cooling: The fan starts up immediately when the laptop is booted, speeds up for a short time and slows down again. It then stays off for a while and turns on and off sporadically during Internet surfing or low load. The fan infinitely turns up during load and slows down just as infinitely and within a fairly short time after the task is finished. The fan is audible (whir) during games (StarCraft II demo) and warm air is discharged out of the vent. The case is otherwise cool all over. The fan turns itself off occasionally and the noise seems to only come from the installed 500 GB hard disk. Sound: The sound emitted from the built-in speakers can very well be called good, although there is no expensive brand name on the speakers. Thus, enjoying a movie at low volume shouldn't be a problem with that. The speakers are installed between the keyboard and display of the base unit and have a perforated, black cover. Operating system: Windows 7 Home Premium (64 bit) is installed and thus uses the entire 4GB of RAM (distributed over 2x2GB), minus that what's left over for the graphics chip of course. The RAM can be upgraded to 16 GB with, not yet available, 8GB modules. An upgrade to 8 GB via two 4 GB modules is very imaginable thanks to the 64 bit operating systems and affordable RAM prices. Verdict: Not a bad catch for the given performance. Thanks to Intel's mobile dual core with incorporated graphics, its strong and durable at the same time. And fairly quiet, depending on the demanded performance. When performance is needed, the temperature increases quickly and thus the fan's noise. But it sinks very fast when the load is finished. The fan is almost annoying at its highest speed, though. The case stays cool everywhere during low load. The bottom, but neither the keyboard surface nor the wrist-rest, gets strikingly warm during load. 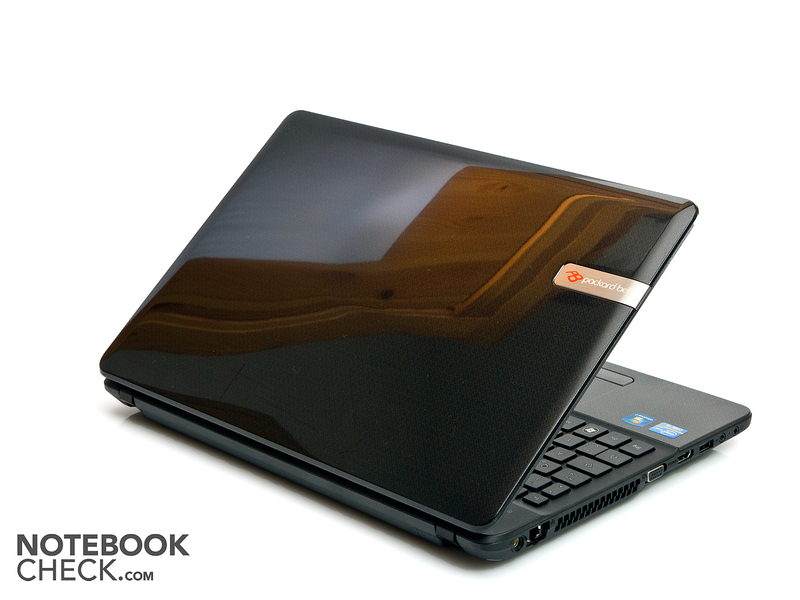 The Packard Bell EasyNote TS11 notebook. The TestIT!2011 test sample didn't allow us to look at its innards. The webcam built into the display bezel. ... a look at the side. ... should of course not be without a number pad. The display hinges can't prevent teetering. The keyboard also made a good impression. The touchpad is multi-touch capable and was convincing. The display lid has a high-gloss finish. From the Intel TestIT!2011 campaign. 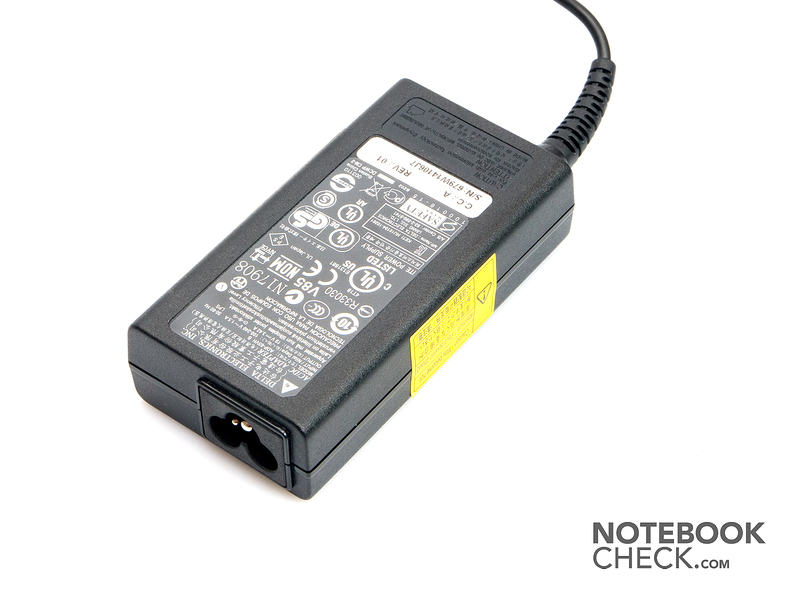 The small power adapter supplies 65 watts. The good keyboard and the solid case. That it's quite difficult to find the notebook's right version in retail. While the model in review is still called TS11-HR-040UK, a corresponding version also turned up in Germany in the course of the review. It's called TS11-HR-050GE. Competition comes from MSI with its A6400 Ci507 S laptop, for example. It is also a 15 inch notebook with an Intel Core i5-2410M processor and an Intel HD Graphics 3000 card. The MSI laptop is available for starting at 510 euros. The other participants of the TestIT!2011 campaign will follow in the next days.